The most successful independent film in Japanese cinema history! 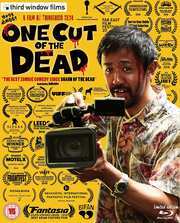 A cast of relative unknowns, a brilliantly disguised low budget and an epic, 37-minute opening single take makes Shinichiro Ueda's feature debut a bright, breezy and laugh-out-loud hilarious zombie comedy. A film crew is shooting a zombie horror flick in an abandoned water filtration plant, allegedly used for human experiments by the military. Just as the director browbeats his actors and demands more special effects blood, a real zombie apocalypse erupts, much to his auteur delight. LIMITED EDITION BLU-RAY CONTENTS with over 2 hours of extras!